Loriee Fonseca was called home to be with Our Lord and Savior March 21, 2019. She was born December 11, 1925 in Ecleto, TX to the late Jose and Catarina Garcia. 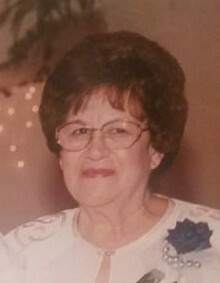 Those left to cherish her loving memory are her children; Daniel Fonseca Jr. and wife Elvira, Raymond Fonseca and wife Ofelia, Enedina Muniz, and Anita Vasquez and husband David. Grandchildren; Kristi F. Williams, Marisa Fonseca, Ramona Fonseca, Roger Muniz, Rene Muniz, Victor Vasquez, Orlando Vasquez, and twenty four great grandchildren. She was preceded in death by her husband Daniel Fonseca Sr., grandchildren Jamie G. Fonseca, Fernando G. Fonseca, Raul Fonseca, Rachel Fonseca, and Randy Vasquez, sons in-law George Muniz and Victor Vasquez Sr.
Loriee enjoyed playing bingo, traveling and she loved spending time with her family. She was a wonderful mother, grandmother, great grandmother, and friend who will be deeply missed by all. Visitation will be 3pm-8pm Friday March 22, 2019 with a rosary service being at 6pm at Chapel of Grace Funeral Home. Mass of Christian burial with Father Rudy Crasta presiding will be celebrated 10am Saturday March 23, 2019 at Holy Spirit Catholic Church with interment following at Terry County Cemetery.